Combine an automotive experience at the V8 Hotel in the MOTORWORLD region of Stuttgart with a well-maintained 18-hole break at the Golfclub Schönbuch, the Leading Golf Clubs of Germany facility on the edge of the Schönbuch Nature Park. Hit the multi-gold (DGV Golf & Natur) 110-hectare club course and enjoy 18 holes just a few miles from the V8 HOTEL. The course, which is laid out on slightly hilly terrain, offers players of all abilities a fair, sporting challenge in a dreamlike environment. Varied paths with lakes and streams, surrounded by orchards, dominate the square on the edge of the Schönbuch Nature Park. 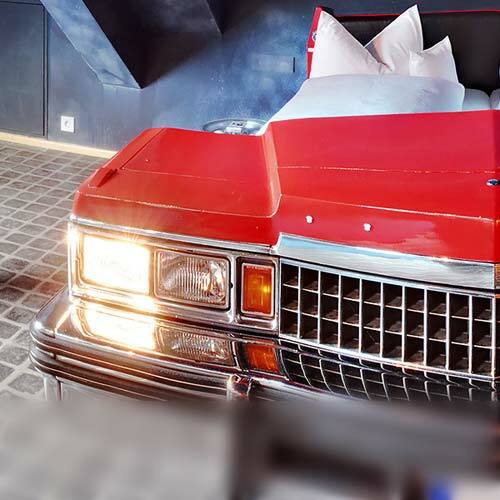 Enjoy over 25,000 square meters in the former halls of the first airport of Württemberg, beautiful vintage cars, PS solitaires, sporty Youngtimer and spend a night in one of our spacious design double rooms. 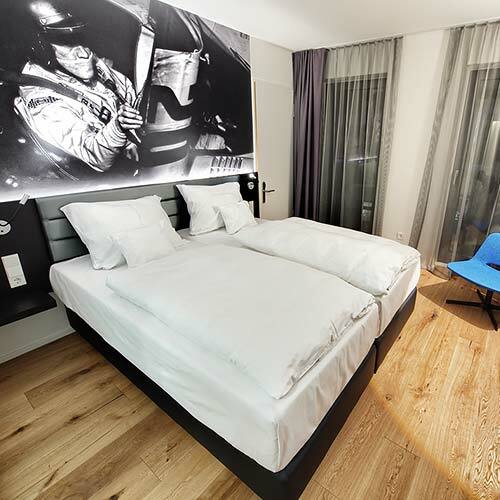 For a small additional charge per person, you can also book one of our 26 automotive themed rooms. Sleep, for example in a Land Rover in the wild in our Theme Room Off Road or in an old Mercedes-Benz in the car wash.
After your round of golf, relax in our fitness and wellness area, before you end the evening in our restaurant or at the hotel bar. 2 nights in a design double room.